The Jostaberry produces large, dark-red berries which have a unique, exquisite taste, and are high in vitamins. Ideal for containers on the patio, it will crop from July to August. 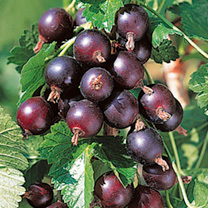 It also shows good resistance to mildew and has very few thorns, making easy picking. Supplied in a 2 litre pot.